Like most Minnesotans, we use natural gas to heat our home and our water, and we used it to cook our food. It’s an accepted fact that “natural gas is cheaper and easier to cook with.” But this remodel was all about looking into the future and rethinking common knowledge. We had to ask ourselves, is it time we disconnect from natural gas? The outlook for natural gas is not smooth sailing. While we seem to have “plenty” (estimates vary from an unlikely 100 years to 40 years), natural gas developers have had to turn to the more costly and damaging method of horizontal drilling (fracking) in order to tap natural gas reserves. Click through to the article above and you’ll see that wells accessed in this way deplete much faster. So what we can see about the future of natural gas is a period of low prices, then price variability, then rising prices. Natural gas is, after all, a fossil fuel. It’s not a renewable energy source so once it’s gone, it’s gone. And it does produce greenhouse gases, though much less than coal and oil. So if we’re trying to reduce our use of fossil fuels in all other areas of our life, we should also think about how we can reduce it in the kitchen. Natural gas comes into play with heating the space and heating food with a gas stove. The Range: We had a newer gas stove and we liked cooking with gas. But we had to move the stove and the gas piping. Now was the time to consider a switch. Was a gas stove really the best, most energy efficient option? The Broan vent hood and Electrolux induction/convection range we chose. We have on-site solar, which operates most of the year (though not when covered in 3 feet of snow). We decided to make the switch to an induction cooktop and convection oven. We don’t produce enough electricity to offset all of our current usage but we are grid-tied so we get electricity from Xcel when we’re not producing. We don’t have any more room on our roof so we can’t increase on-site production. Luckily a new opportunity has become available in our area. The Lake Street community solar garden is located just a few blocks from our house. The cost of a panel on a community solar garden will vary on installation so it won’t be helpful for me to share exactly how much this one cost. What I can say is that it was more affordable than putting the array on our house. Plus, someone else does the maintenance to keep it snow free. We bought 3 panels to offset the added electricity we will be using. Hot Water Heating: We have a standard tank water heater powered by natural gas. We have no space for solar hot water heating. We have considered a whole-house, on-demand electric water heating system but our current water heater is a high efficiency one and it’s still functioning fine. The EPA says you can save 27%–50% on your water heating energy use if you install on-demand water heater at each hot water outlet. We decided to add an on-demand hot water system at the kitchen sink. It works wonderfully. We save water by not having to leave the water running for many minutes before hot water gets to the sink. We can use it to fill the french press for coffee, to make a quick cup of tea or canned soup or to get a pot of pasta started. We expect its use will also be offset by our solar garden investment. At the moment, we have no good options that would allow us to move away from gas home heating. Our goal, then, is to minimize heat loss so we use as little gas as possible. Luckily, we had a lot of room for improvement! 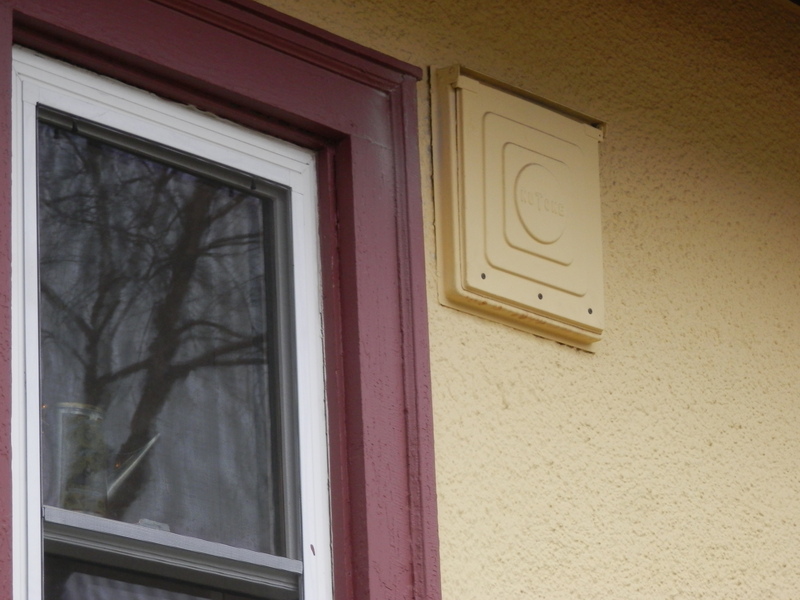 This is the old vent to the outside – a tin cover over a fan. 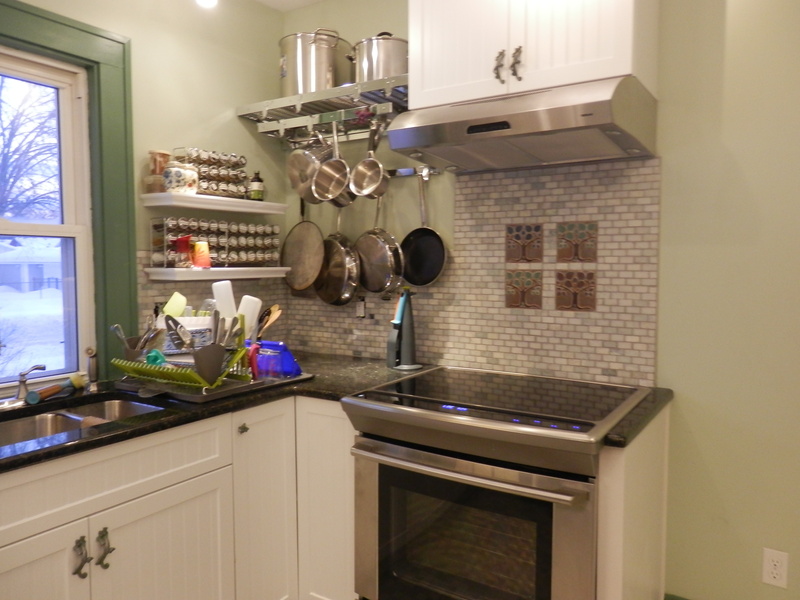 The Range Hood: Our first task was to change the range vent. Our 1921 bungalow had a hole in the wall with a fan in it, covered by a piece of tin. We pulled a cord, the piece of tin swung outward, and the fan started. On howling windy winter days, the tin rattled. I could SEE money seeping out around the edges. It’s now screwed closed, with two types of insulation, wood, sheet rock and a cabinet between us and the outside. Top of our list was getting a regular vent hood, which is insulated. Adding a hood above the stove determined where the stove would be located. That decision determined where everything else would go. The vent we chose had one other energy saving feature – LED lights. Hot Air Vent Placement: While it was nice to have toasty warm toes while washing dishes, having the only hot air vent in the room located inside the sink cabinet was not wise. The sink moved but we couldn’t leave the vent where it was because it would have blown heat onto the back of the refrigerator. Our HVAC guys had to create an arduous path through overstuffed floor joists in the basement and through two closets to come up in the floor at the top of the stairs. The walls on the first floor had been insulated more than 20 years ago – possibly much earlier. What we found was bulky foam from top to bottom between the wall studs but huge air pockets along every stud where the foam had pulled away. And there was no insulation between or around the windows. We planned to spray insulating, air-blocking foam (you can see an example here) on the two exterior kitchen walls. It would give us maximum r-value. Unfortunately, a problem with the plumbing inspector’s schedule – and then the overall building inspector – meant we couldn’t spray on our assigned day. Getting on the insulator’s schedule again – or anyone’s schedule – would have put the project out 6 weeks. We read all the do-it-yourself reviews and decided spray foam insulation was a project best left to the professionals. With a heavy heart, we kept a sizeable chunk of money in our wallet and installed regular wall insulation ourselves. It’s the best we could do and better than what we had. So, I’ve outlined our thinking and the choices we ultimately made regarding electricity versus natural gas. I’m not an engineer but I did my research on the current thinking and the currently available technologies. I may have made wrong decisions, but I hope we’re heading in the right direction, AWAY from fossil fuels. In the end, it’s progress, not perfection. All of these technologies will eventually wear out and I can make a different decision later, if need be. This entry was posted in Energy, Water and tagged eneergy efficient appliances, energy efficiency, induction cooktop, insulation, on-demand water heating. Bookmark the permalink. You are very brave for taking the jump away from natural gas! But you are the first as many will need to figure out the same jump in the future. There is a lot of loose talk about a 100 year supply of natural gas. That 100 year supply number is the amount of Resources that we can technically drill and recover, but, and this is an important but, without any cost factored in. So a patch of natural gas counts as a resource even if it takes a 6.5 million dollar natural gas well to recover the amount of gas used by a home for 1 year. But could anyone afford that gas? No. Reserves are the amount of natural gas Resources that can be recovered at reasonable costs and those are much, much smaller. About 10 to 20 years worth at current levels of consumption. If the industry does manage to get exporting natural gas approved, then we can expect to see price spikes just like what happened to propane last winter. Propane is a byproduct of natural gas production. It is fairly abundant today, but we allowed exports and that drove up the price to record levels. The propane will decline with a decline in natural gas. So that is not much of an option. Cooking uses little fuel compared to heating. So why change? The big problem will be that as prices rise people will be priced out of home heating. There will be fewer and fewer homes on the natural gas grid. The utility will have to keep raising rates on the shrinking number of homes. Eventually they will have to cut the outer fringes off the natural gas grid. This is what is happening to Detroit. The houses are empty because there are no jobs to pay for them (caused by peak iron ore and peak coal in the US driving up the cost of auto manufacture). So what is a kitchen cook to do? What is our future likely to be like? How should we plan our kitchens? If the renewable energy revolution takes off, then it will be solar PV and wind power (in this area) and both of those produce electricity. So electricity is a good idea. And because of the urban density it is important not to create pollution (say via a wood stove) and electricity is very good for that. If the renewable energy revolution is blocked by existing industries, electricity is still likely to be available in the city, via distant coal power plants. Not as clean, but still better for the cook. Look to Japan and other countries that have little natural gas. They don’t heat with natural gas. And they often cook with bottled gas. So just enough heat for cooking. Bottle gas cookers can be inexpensive. And eventually they could be filled with biogas from waste decomposition. Consider a porch or outdoor kitchen that can catch the sun and use a solar oven or solar stovetop. I like the idea behind this model because it can reach frying temperature even in cold weather. Perhaps by the time my new range poops out we’ll have that biogas option available to us.